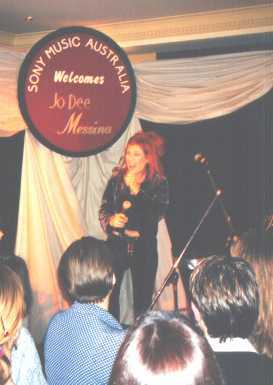 Tuesday, 13th October 1998 - Sony Music Australia welcomed Jo Dee Messina to Sydney. The Paragon Hotel, near historic Circular Quay, was packed with Music Industry pundits. After a whirlwind promotional tour that included major National TV shows, and regional appearances in Dubbo and Mackay, Jo Dee finally made it to a Sydney stage, vowing to return in 1999 with her band for a full tour! Accompanied only by Australian guitar master Rod McCormack, Jo Dee won over the crowd with her down-to-earth charm and spectacular voice. Although she only performed a handful of songs, the experience was made richer by her vivid descriptions of the inspiration behind the lyrics from her album, "I'm Alright". She told the audience that as a girl she dreamed of coming to Australia, but "never thought that country music would bring me this far!" 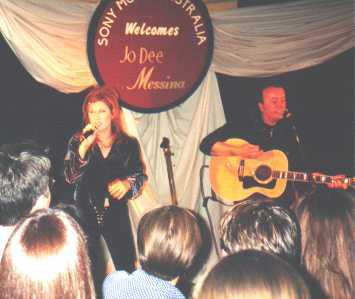 Pictured Right:- Jo Dee Messina & Australian guitarist Rod McCormack. Pictured Left:- Jo Dee praised the hard work of Sony Music's Sam Laws. "His mobile phone rings every thirty seconds and he says it's all business," she quipped to the audience. Visit our good friends at The Country Music Store in Brisbane to order your Jo Dee Messina CD's.